In this post, we are going to start writing our unit test. We have already created SampleArch.Test project for unit testing in Part 1. Now we will use Moq library for mocking. Add reference of all other projects in it. For controller testing, we will create Mock service objects and test controller methods. For simplicity, we are going to test CountryController. Similarly, you can implement test methods for other controller’s action. For this, we will create Mock repository and other objects which are used in service methods and then test Service methods. Initialize: To initialize mock repository, mock unit of work and service objects. 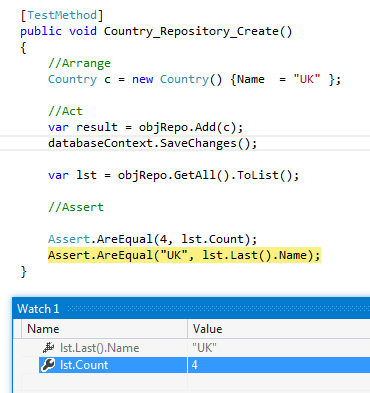 Can_Add_Country: To test service Create method. Similarly we can test other methods. It is less required to test repository because EF is already well tested. 1. Here two types of constructor defined: one uses connectionstring name and another uses DBConnection object. We will use both types. You can set other DropCreateIfChangeInitializer,CreateInitializer depending on your requirement. We will do in both ways. We are going to use Effort library for this. Initialize: To initialize Effort, context and repository object. Country_Repository_Get_ALL: To check GetAll method of the repository. Country_Repository_Create: To check Add method of the repository. It is similar to earlier except Initialize changes. Now we are using our regular provider and creating database each time. We have seen how different layers can be tested without touching the existing application code. You can get Source Code in last part of this series. When you share the code ? Please share the code.